The Forty-third United States Congress was a meeting of the legislative branch of the United States federal government, consisting of the United States Senate and the United States House of Representatives. It met in Washington, D.C. from March 4, 1873, to March 4, 1875, during the fifth and sixth years of Ulysses S. Grant's presidency . The apportionment of seats in the House of Representatives was based on the Ninth Census of the United States in 1870. Both chambers had a Republican majority. March 18, 1874: Hawaii signed a treaty with the United States granting exclusive trading rights. Before this Congress, the 1870 United States Census and resulting reapportionment changed the size of the House to 292 members. Henry B. Anthony (R), elected January 25, 1875. Senators were elected by the state legislatures every two years, with one-third beginning new six-year terms with each Congress. Preceding the names in the list below are Senate class numbers, which indicate the cycle of their election. In this Congress, Class 1 meant their term ended with this Congress, requiring reelection in 1874; Class 2 meant their term began in the last Congress, requiring reelection in 1876; and Class 3 meant their term began in this Congress, requiring reelection in 1878. 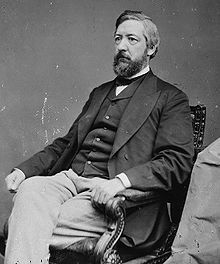 Massachusetts (2) Vacant Henry Wilson resigned in previous congress after becoming Vice President of the United States. Mississippi (1) Adelbert Ames (R) Resigned March 17, 1873, after being elected Governor of Mississippi. Kansas (2) Alexander Caldwell (R) Resigned March 24, 1873. California (1) Eugene Casserly (D) Resigned November 29, 1873. Massachusetts (1) Charles Sumner (LR) Died March 11, 1874. Connecticut (1) William A. Buckingham (R) Died February 5, 1875. Congressional Directory for the 43rd Congress, 1st Session. Congressional Directory for the 43rd Congress, 1st Session (1st Revision). Congressional Directory for the 43rd Congress, 1st Session (2nd Revision). Congressional Directory for the 43rd Congress, 2nd Session. Congressional Directory for the 43rd Congress, 2nd Session (Revision).